You might remember that when I started this vest, I didn't even really want to make it. I wasn't so much interested in the project as I was compelled. I just couldn't get the idea of it out of my head. And so once I let go the question of whether or not I was going to make the thing, it pretty much leapt, fully formed, out of my head. Not unlike sneezing. You know it's coming, and there's not a darn thing to be done about it, except possibly to protect innocent bystanders by adjusting your aim. My mother always told me and my sisters when we were growing up that we should avoid horizontal stripes because they are unflattering and make you look wide in all the wrong places. Sorry, Mom, but I think I may have proven that theory wrong. I love it when people say that stranded colorwork garments are unflattering because they are nothing but straight lines, with no shaping. To those uninitiated, I offer the Violet Vest: Steek-A-Palooza. 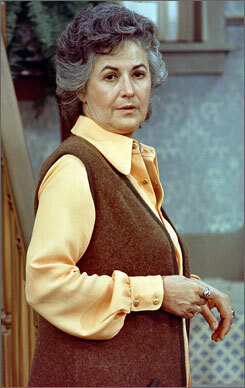 And as for the style, I'd say it's somewhere between Bea-Arthur-As-Maude, and Bohemian Dirndl. Stripes are not usually the first design element I think of, but I really dig the way they highlight the shaping, by bending around it. I also love the peasanty bust gathers above the waist detail; very comfortable to wear. So now that I have that out of my system, I'll be returning to the Weasley jumpers, the second sock, and possibly some more Japanese oak leaves. Just gotta locate the tissues first.